How can I use Bookmark.house? For example, you are searching on Google. If you find a page that looks useful, let's save it with the Bookmark.house browser extension. Then you can prevent things like "I saw useful page before, but I forgot!". You can search pages saved in Bookmark.house by full text search. Let's add tags and add notes to saved pages. If you put tags on a bookmark, it will be easier to find the saved page later. If you type "#" in the full-text search bar in Bookmark.house, the tag completion will start. It allows you to quickly reach the target tag and page. You can quickly save the page with Bookmark.house browser extension. You can install extensions for each browser from the link below. 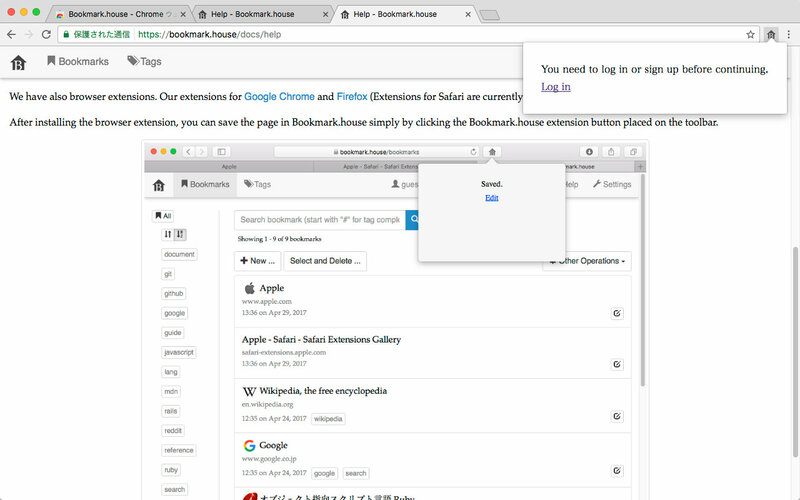 After installing the browser extension, you can save the page in Bookmark.house simply by clicking the Bookmark.house extension button placed on the toolbar. If you saved the page using browser extension, you can save the contents of the page in Bookmark.house. The contents of the saved page can be displayed with button. You can enable Bookmark.house extension button in iOS Share Menu. This will make saving pages to Bookmark.house easy from Safari and other apps. If you are using iPad, while opening Safari you can display Bookmark.house app with Slide Over and quickly access the saved bookmarks. You can install the Bookmark.house Bookmarklet. The bookmarklet can be used to save whatever page you are viewing. Drag the link below to your browser's bookmarks bar or favorites bar. Then simply click it when you are on a web page you want to bookmark. To enable keyboard shortcut, set it to ON in the settings page. You can see the help of the keyboard shortcuts by pressing the ? key or click here.